THIS IS IT!! LOG IN NOW!! LATE COMERS can choose He-111, Bf110, 109E-1, Blen (CAP), or Hurri (Alert). Also, who else can film?? STATUS: Need a few more He-111's. Some Blen I's would be nice (they will be in air long before bombers come). Am looking at balancing the numbers (total vs total), the balancing may give you a better unit. MORE CAMERAMEN wanted! step up, please! (you can play, just record the events). 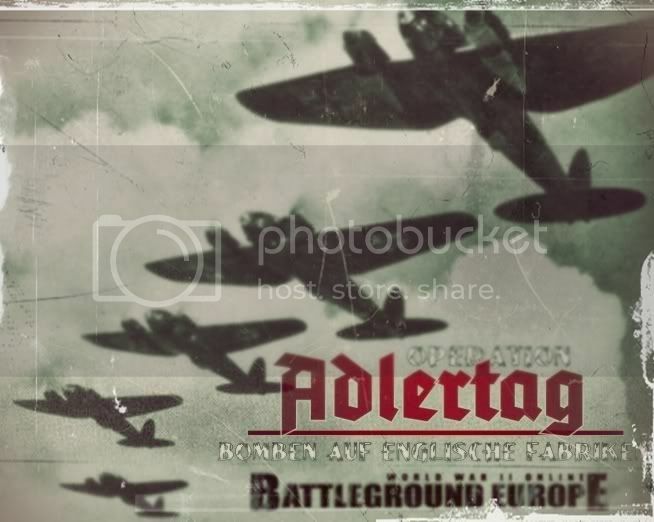 Battle of Britain (Adlertag) event history. France surrendered, the British suffered an embarrassing military defeat in Belgium (narrowly avoiding complete disaster), and the German military was now setting their sights on UK proper. 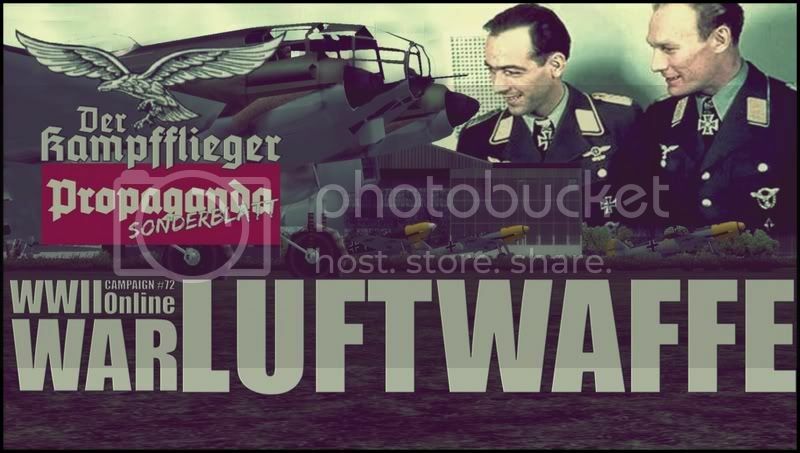 Hermann Göring boasts his vaunted and feared Luftwaffe can crush the RAF. Out numbered 3 to 1, can the RAF hope to stop them? By participating in this, you honor the memories of those who participated in the real life and death event 71 long years ago. Just like in the real battle, the defenders WILL be outnumbered, victory will be in minimizing the damage to the UK factories. TWO VICTORY CONDITIONS: Because the RAF are outnumbered, how well the RAF does in shooting down the LW counts toward MORALE victory, as well as usual material victory. More Hurricanes are added to represent the Bolton-Paul Defiant and other RAF fighters, but the LW will be close to historical mix. There is NO re-spawning. If you KIA, MIA,or RES you have lost the aircraft. If you succeed to land at friendly AF you can respawn and go up again. All continental AF are Axis, and can be used to RTB (Calais is closest LW AF to UK). LW take off from Maubeuge on a single mission, but will split into 2 equal size group and approach UK from different directions. The bombers will perform some maneuvers to keep the formation and ensure entering the target area same time. RAF will spawn at Folkstone (Hurri and Blen) and Eastchurch (Spit only). RAF *cannot* cross the French or Belgium coast. Instant smite if they do so. # of LW bombers shot down for RAF / total number = % Victory. Adjusting points in number of fighters shot down for each side. The advantage is clearly to the LW, however the goal of the RAF is NOT to shoot down the bombers but make them miss! Ideally do both, but making them miss first means you then have more time to finish them off later. RAF have the home field advantage, meaning alt and position, while the LW are forced to stay close to bombers. The LW have time advantage, meaning the drop point for bombers is very close to coast. RAF have to hit bombers fast or its too late. There will be ALERT squadrons of Hurris and Spits on field who have to wait until ordered to scramble, it will be close, the calvary coming over the hill. Hurri's and Blen's will have position advantage, still want to fly a Spit?? Here is the RAF orders map. Luftwaffe is to follow this general path. Target might NOT be Canterbury, and arrive at different times. NEED CAMERAMEN, please step up. If you want to be a flight leader please say so. Bf-109E-4 (and as almost identical 109E-3) E4 is CLOSED until we get some E1 in!! i have some limited video capture abilities also. Have to make sure I have the day off but tentatively, I'll take a 111. Sign me up for a Spitfire please. Also, can you please put Mjdixon down for a spitfire. He is currently watching planes tootle about the sky at the Duxford airshow, all on 19 squadron expense I might add, so he can't sign up himself atm. I'll take a 111 again this year. Are we sure about the date? Seems 1) wrong year 2) wrong day since 21st is Sunday. I can try to make it. Just on the chance that I can not though I don't want to sign up officially, but you might have yourself another 111 in the air. OMG!!!! SHOT DOWN BY A HURRICANE!@@! Sign me up for a Hurricane!!! I need a wingman!! LOL!! Spit for me Sir !